Click the Neverending Spritewood near 47.5, 73.5. This will turn the nearby Nice Sprites into Angry Sprites. Killing many of these Angry Sprites will spawn a Scary Sprite, which you can kill for the pet. Note that you can use the Neverending Spritewood only once per day and after someone has used it, you need to wait for it to respawn. It is once per day per toon. Scary sprites are random so just aoe like hell and pray that they spawn. You are able to loot this NPC multiple times a day. You can only click the crystal once though. To loot more than once you simply group with somebody who is about to, or already clicked the crystal. You can then loot whatever they kill during this event. To attempt to kill as many as possible, I recommend eating all three "buffs" Singing Crystal Dew of Eternal Morning Book of the Ages, and tapping a buff stone, and eating a nearby fruit for the nutriment buff. In addition if you are fortunate to find a legendary item when the crystal happens to spawn, so much the better. The spawn rate seems to be completely random. One day I killed quite a lot of them (50+) but it didn't spawn. Another day it spawned right after I clicked the Neverending Spritewood. Just a matter of luck, I guess. Edit: Indeed, today I had four of these scary sprites spawn on me one after the other, about 5 secs apart from each other. No pet, sadly, but it shows it is all very random. This mob has a chance to drop a pet: Dandelion Frolicker. See the pet's wowhead page for more tips! EDIT: "Scary Sprite now deals 40% less damage and should spawn slightly more frequently." -Patch 5.4 Hotfixes, October 2 (Source http://us.battle.net/wow/en/blog/10932273/ ). Note, Blizzard often applies hotfixes and doesn't get around to telling us until a few days later. Thus, this change was probably applied a few days *before* Oct 2. You can summon more than one Scary Sprite while under the same buff from a single crystal. Just need to kill "enough of Angry Sprites" more than once while the buff is active. Just a lot of luck today or a spawn rate increased ? 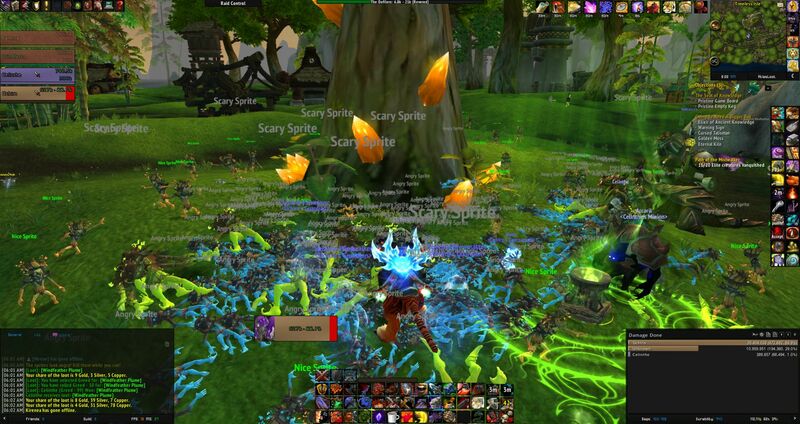 New record today - 10x scary sprites- all isle buffs + 3 pandaren monks for spinning crane kick. Kinda messed up and forgot to swap out the teleport trinket and go arms since I was in a rush. While this is a small sample size you can help yourself out by doing a couple things. 1) Use a high DPS class, on my Arms Warrior I can spam Victory Rush to keep myself up. 2) Have a healer in group, make sure it is someone you trust as they will be able to roll on pet if loot is set on group. 3) Get an invite to a low pop server, the crystal is almost always up on my server while they may be camped on a high pop. 4) If a Scary Sprite spawns focus it down ASAP, if the timer runs out before the sprite is dead it turns back to green and you cannot kill or loot. Hope this helps happy hunting! Killed 16 Scary sprites, pet finally dropped. Solo'ed the whole massive pack constantly until by buff ran out, ilvl 545 mage. * Archiereus of Flame is only lootable once a day according to people who've talked to GMs. I've activated the Crystal about 5 times now, used incarnation as Guardian Druid and blew through many, had about 5~6 Scary Sprites spawn each time, but no pet yet unfortunately. Requires 560 Herbalism to pick their bodies.